Author(s): P. Balachandran, T. V. Ajay Kumar, V. Parthasarathy. Immunology Laboratory, Department of Pharmacy, Annamalai University, Annamalai Nagar-608002, Tamilnadu, India. The present research focuses on the molecular docking analysis of the isolated compound from the seaweed “Sargassum wightii” on cancer specific HER2 or HER2/neu also known as CD340. The ethanol derived compounds capable of binding to HER2 receptor is implicated for the breast cancer. The crystal structure of the HER2 protein with the resolution of 1.63Ao (Pdb entry 4RJ3) collected from the pdb website (www.pdb). Missing alignments and the side chains are prepared to fit for the insilico analysis. Seven bioactive compounds isolated from the hydro-alcoholic mixture using GC-MS are docked against HER2 using Schrodinger 2013.1 (Glide version 5.9). The binding sites, glide score and the energy of the 7 compounds with the HER2 protein are compared. The isolated compounds with most negative glide score such as benzoic acid, 2-hydroxy-ethyl ester, methyl salicylate, diethyl phthalate and phytol exhibited efficient in inhibiting the HER2 receptor of breast cancer. The Pharmacokinetics and Pharmacodynamics (ADME) properties of the selected highest glide scored compounds are performed using QikProp 3.6 module from Schrodinger-Maestro software. The compounds were showed significant ADME properties in basic criteria of Molecular weight (MW), H-Bond donor, H-Bond acceptor and log P (O/W). The results of the study showed that the compounds of “Sargassum wightii” may be a good target for breast Cancer. Keywords: HER2/neu, Sargassum wightii, breast cancer, Schrodinger maestro, in-Silico analysis and QikProp. Affiliation:Immunology Laboratory, Department of Pharmacy, Annamalai University, Annamalai Nagar-608002, Tamilnadu, India. Keywords:HER2/neu, Sargassum wightii, breast cancer, Schrodinger maestro, in-Silico analysis and QikProp. Abstract:The present research focuses on the molecular docking analysis of the isolated compound from the seaweed “Sargassum wightii” on cancer specific HER2 or HER2/neu also known as CD340. The ethanol derived compounds capable of binding to HER2 receptor is implicated for the breast cancer. The crystal structure of the HER2 protein with the resolution of 1.63Ao (Pdb entry 4RJ3) collected from the pdb website (www.pdb). Missing alignments and the side chains are prepared to fit for the insilico analysis. Seven bioactive compounds isolated from the hydro-alcoholic mixture using GC-MS are docked against HER2 using Schrodinger 2013.1 (Glide version 5.9). The binding sites, glide score and the energy of the 7 compounds with the HER2 protein are compared. The isolated compounds with most negative glide score such as benzoic acid, 2-hydroxy-ethyl ester, methyl salicylate, diethyl phthalate and phytol exhibited efficient in inhibiting the HER2 receptor of breast cancer. The Pharmacokinetics and Pharmacodynamics (ADME) properties of the selected highest glide scored compounds are performed using QikProp 3.6 module from Schrodinger-Maestro software. The compounds were showed significant ADME properties in basic criteria of Molecular weight (MW), H-Bond donor, H-Bond acceptor and log P (O/W). 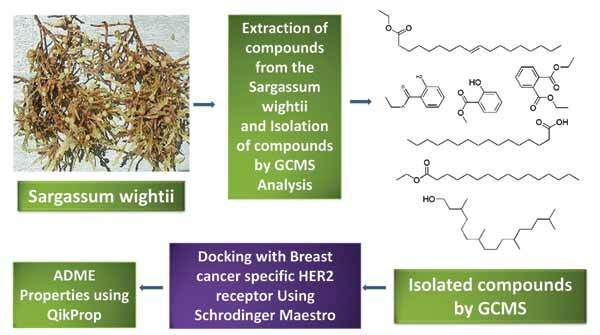 The results of the study showed that the compounds of “Sargassum wightii” may be a good target for breast Cancer. Comparative Proteomics Analysis of SKBR3 and MCF7 Breast Cancer Cell Lines Using Two Dimensional Electrophoresis: Ready to Build Postgenomics Capacity for OMICS R&D in Developing Countries?